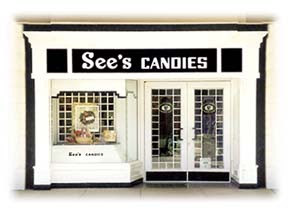 Since we're talking about traditions, sit down and let me tell you a little story about a magical world called See's Candy. For those who don't live in California, this story might sound very foreign. To those who have visited California or who actually live in California, feel free to add to my story in the comments. I'm sure all my Southern Gals would love to hear from this Yank. Enter these doors and you are instantly surrounded by sweet smells and clean, crisp sights. The shoppe is black and white (so simple, so elegant). The smells - exquisite. Walk over to the counter and see a smorgasbord of goodies. Hershey's? Yeah, you Pennsylvania people have Hershey's and even a park piped with the chocolate treat. But y'all don't have anything on See's. Godiva, Dove, and Ghiradelli? Sorry, Charlie. The absolute best chocolate on earth happens in the little black & white shoppe. But I have a See's Candy Shoppe in my community! you might say. It's ain't all that and a bag of chips. Oh, nay-nay, I say. Your shoppes probably have pre-packaged goodies. The only shoppes I've been into that has the fresh goodness of See's was in California. If you find another piece of heaven, please enlighten me! For the rest of you, do yourself a favor and buy yourself some chocolate this holiday season.